Wellingborough Grammar School is one of those places that was absolutely special to those who knew it. Externally the buildings in Doddington Road look exactly the same today as they did over fifty years ago when I first stepped through the (side) door, but inside the ethos was very different. Today it is the Wrenn School, freely available to all boys and girls in its catchment area, then it was a privilege to attend for those special few who won a scholarship. Then, as now, it was a community for the enrichment of its students (then called pupils! ), but then only 5% of the population went to university instead of the current 50% into higher education and the Grammar School aimed at one goal: excellence, in academic (and sporting) achievement. My brother Graham and I have written a book about Wellingborough Grammar School. You can find out about it here. We were taught always to be diligent. The headmaster advised us to have a book in our pocket at all times, to study in case we were waiting for a bus or on a journey when we could fit in a few minutes extra work. Every evening we had three lots of homework that was intended to occupy an hour and a half. After school there was a wide choice of clubs to extend our interests. I never had time for the scouts or the stamp club, the railway club, but I made puppets in the puppet club, acted in the school plays, learnt to play the violin and viola, sang in the junior choir, senior choir, madrigal group, male voice choir, played in the school orchestra and, in the sixth form, played rugby for the school first XV and the Northamptonshire county schoolboys. Fundamentally, I was a “swat” who did all the work I was told to do (and more), and competed to be the best in absolutely everything I did. I was never “one of the lads” who had fun playing around, and never noticed that I often sat alone in the classroom because I was so focused on the work I was doing. It is not that I lacked friends, for I had many, but that the challenges I responded to came first and the friends that I had were related to a particular activity, be it music, or rugby, or the church youth group, or whatever was the task for the moment. In my activity I was always fulfilled and happy, never bullied at any time, always seeking to do my best. In my first interview with Mr Wrenn, the headmaster, I was asked, “What do you want to be when you grow up, Tall?” “A doctor, Sir,” I replied firmly. “Too many doctors, be a dentist.” That short interchange destroyed the ambition that I had since I was young. But it did not weaken my main goal that my mother had talked about with a gleam in her eye. She was certain I would go to go to Oxford and get a knighthood. My middle name was “Orme” and my mother liked the idea of “Sir David Orme-Tall”. It never happened, but the ambition to get to Oxford was achieved and, as the years passed, she settled with the lesser aim of being “a professor”. 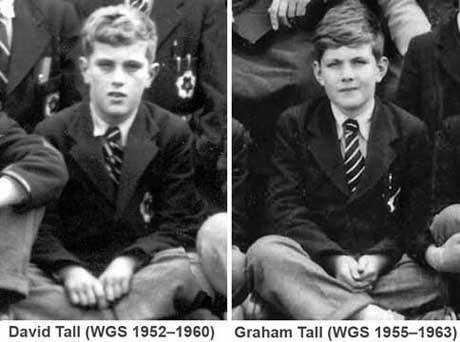 To understand what happened to us as boys at Wellingborough Grammar School, it is essential to take account where we came from. My mother was an intelligent woman who felt aggrieved that she had never had the opportunity for academic advancement because she was a girl. My father was a steel-worker, whose only ambition was to work hard and be a good family man, and my mother, after training as a secretary and taking several years to raise a family, had taken work in a shoe factory to supplement the family income. She saw only one escape from this working class life: through academic success. She always encouraged me by saying that I had the native intelligence to succeed, to this I must add total commitment and sheer hard work. My sole aim was to go to the Grammar School and compete to be the best in everything. My first year at the Grammar School was somewhat strange. I had the ’flu at the time of the first term exam and missed it. Spike Jackson commented that it was one of the best academic years for some time. There were half-a-dozen boys in a cluster at the top with D. G. Pearson two or three marks above C. E. Garley. In the second term Garley outstripped the rest by 38 marks out of 800, but I was 36 marks ahead of him. In the third term, I again missed part of the exams (this time on holiday at Butlin’s during my father’s annual break, if I remember aright), so, despite showing up well academically, I remained something of an enigma in the class as a whole. In the second year I broke my collar-bone in the under-13 rugby trials and never played for the school at under-13, under-14 or under-15. I had begun studying the violin in a class-group during the first year and continued this for two years, then began private lessons on the violin, subsequently the viola, with a few lessons on the cello, at Ronald Harding’s Violin School on Saturday mornings. This entailed catching a bus into Wellingborough town centre from the New Estate where we now lived and then another bus 10 miles to Northampton for a lesson at 8.30 am. (always, of course, with a book in my pocket to study). Afterwards, I played chamber music till 11.00 am, then played in the Junior (String) Orchestra from 11am until 12noon. In those days I took to staying in Northampton to watch the Saints play Rugby at 3.00 pm. They won all their home matches except one during those years, and at times fielded nearly a full team of international players: White, Butterfield, Cannell, Sykes, Hyde, Hetherington, Hosen, Jeeps, Jacobs, Taylor, etc. White and Hyde were old boys of Wellingborough Grammar School and Butterfield was a master at the time. I was inspired. At 15, Johnny Hyde, who was the trainer of the school second XV, gave me a few games; in the lower sixth I was a regular with the 2nd XV, and then became the front row tight head prop for the 1st XV. I was first choice in that position for every match for the next three years! Playing in that Rugby team was hugely character building. We were small, but mobile, which meant that, as the game wore on and our opponents tired, we were able to score many points in the closing minutes. So we learned never to give up. I remember one game in which we were fourteen points down and ended up the winners. On another occasion at Bedford Public School, we were 6-3 down at half time and I had been taken off to have a head injury bandaged in the health centre. The school doctor asked me how the game was going and I said, “You’re 6-3 up, but we’ll win!” We scored a converted try to lead 8-6, but with only moments to go, their winger ran in near the touch-line and trotted round to score under the posts. Our wing-forward, Murray Robinson, followed him and forced him over the dead-ball line. Their player only need fall down and he would have scored. But our team’s never-say-die attitude won the day. Wellingborough Public School played us every year, and one match I remember well. They arrived, immaculately turned-out, running together in convoy, passing the ball, with their kicking specialist practising goal-kicks from the half-way line. In contrast we were laughing and fooling around. But when the whistle went, it was a different story. We won 52-3. Shame about the 3, but at least they were able to score one penalty goal from a distance. This taught me the value of team spirit, the confidence to tackle anything, and always to use minor setbacks as springboards for future development. Tony Sparrow, the first XV coach, chose me for every match because of my total commitment, but said I was too small to play more senior rugby. Nevertheless, in my last year I had a crazy trial for the County Schoolboys. In the first minute, I broke from tight head prop in a scrum to tackle the fly-half in possession (utterly incredible). Then I fell at the feet of a charging bunch of opposition forwards to hold the ball and stop a certain try. I was carried off with a profusely bleeding head-wound after only five minutes of the match. It was enough to get me picked in a county team captained by R. B. Taylor, who later became the captain of the full England team. I still regard this as my greatest triumph, not that it was a great thing to do, but it was a an amazing achievement given my limitations. Academically, I was good in every subject, especially mathematics, English, music and the sciences. I was technically competent in French, but we were only trained to write, not speak, the language. Although I once came second in Art, my work lacked real inspiration. History and geography were OK but I was once struck across the head by Jake Dunning the Geography master. When I asked what it was for, he said, “for coming top in the exam ...”, then adding as an afterthought, “... and bottom in the classwork!” It was my old, left-handed untidiness again. I was simply not able to write or draw elegantly. I regularly got a form prize for being top in my class, and, in my O-level examination year, in classwork I was top in five and second in three out of eight subjects. For my performance in O-level examinations I was awarded the biology prize. An ambiguous first question in Geometry, which I was too proud to leave unanswered, meant that I did not finish the paper and got lower marks in maths than expected. I still got the highest marks in the school in mathematics and also in biology, but the biology mark was the higher and I was awarded the prize in that subject. My mother complained and, thanks to her, I obtained the mathematics prize. The school tried to spread prizes around, so it was difficult to get two prizes in the same year. However, I was given the Senior Mathematics Prize for my work in examinations, the Senior Science Prize for the best lecture given at the Scientific Society and the Senior Music Prize for being the House Captain in the winning team in the House Music Cup. The Music Cup was a riot. I had always felt that I had been cheated out of the Junior Music Prize when my grade V in violin clearly outscored those with Grade IIIs in Piano, who were given the two music prizes in the junior school. The Senior Music Prize was not something that could be won by one’s own performance. It depended on getting together a team which performed a solo instrumental, a group performing chamber music, and choir to perform in the House Music Competition. I was the Captain in two successive years. In the first year I was so incompetent that one of our offerings was of myself and Fred Nutt singing ‘The Old Rugged Cross’ in unison. Miss Thomas, the Music Teacher from the local Girls’ High School was the judge for the competition, and she gave bonus points for all sorts of odd things, such as how handsome the Lion’s choir looked, so that the Lion’s House’s evident superiority was turned into outright victory. The following year, the judge was Neville Dilkes from Kettering (who later became well-known as founder of the English Sinfonia); he was also in the ‘bonus’ business, giving us extra points for our being the only house to offer true chamber music, in the form of a trio for flute, violin and viola from a piece by Beethoven. It was the only piece we could play because we had precisely three instrumentalists (Peter (Fred) Baxter (flute), Martin Spriggs (violin), David Tall (viola)) and there was only this one piece for that combination. Our successful performance gave me the coveted Senior Music Prize. It also gave me my first experience of conducting ... something that would pay off in the future. At School I spent several years making string puppets in the School Puppet Club, doing charity work with the school Toc H group (of which one David Frost was also a member), taking leading roles in School Plays, playing rugby, singing in the School Senior Choir, Junior Choir, Male Voice Choir and Madrigal Group (with girls from the High School), in the Senior Orchestra, three string quartets, the Northampton Senior and Junior String Orchestras, the High Street Congregational Church Choir, the Toc H Male Voice Choir. Almost all of these activities had regular weekly meetings. I was busy. Even so, I found time for other activities, and formed a Skiffle Group with me playing guitar and singing made-up calypsos to suit the occasion. Following me through school a couple of years behind was my brother Graham. He had suffered a severe head injury in an accident at Wicksteed’s Park after passing the eleven plus but before going to Grammar School. His main asset was a good memory (far better than mine) but with this not working on all cylinders, in his early years he struggled, starting in the B class and falling to the C class for a time. He was particularly useless at French. But when he had to make a choice of Spanish or Biology in his second year, he was too confused to make a decision, so, with few boys choosing Spanish, he was put in the Spanish class to make up the numbers. Feeling responsible for my little brother, I went to the headmaster to explain his plight, saying that it was his condition that made him unable to choose, but it would be a disaster if he studied Spanish, because he was so bad at French, it would just give him a second language to fail. Mr Wrenn thought for a moment, then switched my brother to the Biology class. It was little incidents like this that made me respect Mr Wrenn hugely. He was absolutely in charge of the school, like a king with a divine right, but he listened before making decisions. Graham‘s memory came to his aid in reading. Each year we were given a list of books to read and there was a test at the end of the year with a prize for each class. Graham ate up those books in formidable style and won his first reading prize. The next year he got top marks too, but Spike Jackson, the English teacher, told him he had already won the prize the year before, so it was given to the boy coming second. Graham could easily have suffered by comparison with me. But he was better at swimming and that gave him a sense of pride. On one occasion, Jake Dunning said to him, “You are not as good as your brother, are you, Tall?”, a cruel rejoinder, to which Graham, in surprising tone responded with, “No sir, and, with respect, neither are you.” That could have easily have led to a smack across the head for insolence, but Jake was fundamentally a fair man and he took the retort in the manner it was given. Eventually, little brother also was an academic success, going to university at Hull, staying on to do a Master's degree in Education, becoming a school teacher, then a research officer with the Schools Council in London, and finally a Lecturer in Education at Birmingham University where he became the second of Nancy Tall’s sons to get a doctorate. She never thought her second son as an academic. He was the solid influence in the family who would stay in Wellingborough to look after her in her old age while I, as the academic, would go on to higher things and our younger sister Rosemary would become a professional dancer. In that respect my mother was wrong. All her children sought excellence and achieved it. When I was 17, I met Sue, who lived at Earls Barton, four miles from my home in Wellingborough. We met at Overstone Solarium and cycled everywhere, attending each others youth clubs on Monday and Wednesday evenings. At the Grammar School, the A-stream took Ordinary Level examinations a year early at 15, which meant we took Advanced Level examinations at 17. I took the standard four science subjects: pure maths, applied maths, chemistry and physics. I always tried to work hard at all my subjects and, as I found chemistry the most difficult, I reckon I spent half my time on chemistry, a quarter on physics, and the other quarter on the two mathematics exams. Even so, Mr Mardell gave us Durell and Robson’s Calculus to read at our own speed during the first year and I finished it at three o’clock on Christmas day. It was my best Christmas present ever! Given all my other activities, even though I was way in front in calculus, I had to rely on my native wit in other aspects of mathematics. My mathematics teacher, Mr Butler, himself an Oxford Graduate, wrote in my first school report in the sixth-form, “If his effort matched his enthusiasm, he could be a competent mathematician.” My mother was furious, but I was delighted. Here at last was a man with real standards. He was a good clarinettist too, and he, I and the music master Mr Stanley, played the Mozart Kegelstatt trio together. His playing of the Brahms clarinet sonatas also inspired me to play them in their viola transcriptions. I enjoyed Physics too, but for a completely different reason. ‘Chunky’ Pine, the long-serving Physical Education Teacher was getting to an age when he needed to give more academic lessons and was learning Physics as he taught it to us. Sometimes he struggled, but encouraged participation by the boys in the class. I contributed often and began to do my own experiments to an extreme degree, for instance, opening up the cover in the ceiling that led to the loft to tie a long pendulum to the roof in the loft to get as accurate a value for gravity as possible. I got the result between 981 and 982 centimetres per second squared, which pleased me enormously. The encouragment and open support I got from ‘Chunky’ was a highlight of my school life. I obtained distinctions in all four subjects: pure maths, applied maths, physics and chemistry (only the second boy to do so in the history of the school) and stayed on to take entrance examinations for Oxford and Cambridge. This was a huge leap for a Grammar School pupil taking a broadly based science course; most entrants from public schools would have been especially coached in mathematics from an early age. In December, 1958, I entered for a scholarship at Magdalen College Cambridge and the Master of Magdalen was clearly unimpressed; he wrote to my headmaster saying, “if this man wishes to attend university, he should try places other than Oxford or Cambridge.” By March, 1959, I had progressed, and Wadham College Oxford offered me a place for 1960. subject only to the condition that I continue to study at school and enter the examination again in the next round. That summer I took A-level again, this time in three mathematics subjects at scholarship level, to get three distinctions, giving me (with the Chemistry and Physics of the previous year) five A-levels with distinction, a result not equalled in my school at the time, though, with grade inflation, something that seems to occur with increasing regularity today. 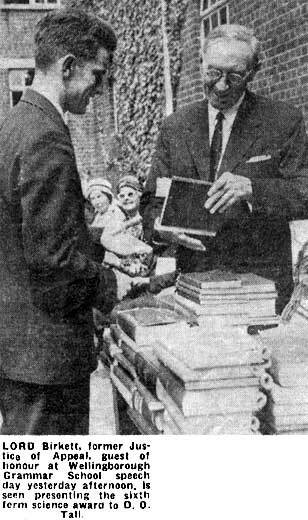 In December 1959, I was awarded a Minor Scholarship at Wadham College Oxford. My headmaster, Mr Wrenn was delighted. “Well done, David,” he said, and strode in to School Assembly and proudly announced the award. Strangely, I remember feeling angry about thishow dare he call me ‘David’? I had never given him permission! How different this was from the way we interact today! Mr Butler restored sanity. I had met him outside the school at about 8.15 am. He had just been to his allotment on the school grounds and was pushing a wheel-barrow full of potatoes. I showed him the letter. He looked at it, smiled, and said, “I’m pleased.” Then he turned and walked on. It was the only compliment he ever paid me. And I treasured it. In the months before I went to Oxford, one of the chemistry masters left Wellingborough Grammar School and I became a master for a termlong enough to get the nickname Dotto based on my initials D.O.T. This was a particularly fulfilling time. I enjoyed teaching. I was successful in teaching difficult classes that others were unable to control, and I felt that in the future, one possibility was to become a teacher. Throughout all my time as a boy in Wellingborough, life was full, demanding and happy!